The scene after the Cave People has us transition from cave drawings to hieroglyphics (writing on walls) as we move into an Egyptian temple (representing the New Kingdom approximately 1567 – 1085 B.C.) on the right. On the left is a man sitting in front of the reeds along the Nile making papyrus. (1) Further ahead an Egyptian pharaoh is dictating a message to a scribe. All of this is done with careful detail. 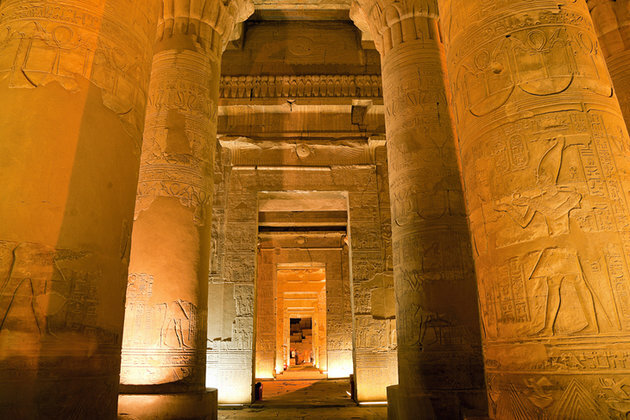 Temples during the New Kingdom were constructed as places of religious worship and dedicated to certain Egyptian gods. The temple scene depicted here reveals an hypostyle hall – a common element of Egyptian temples. 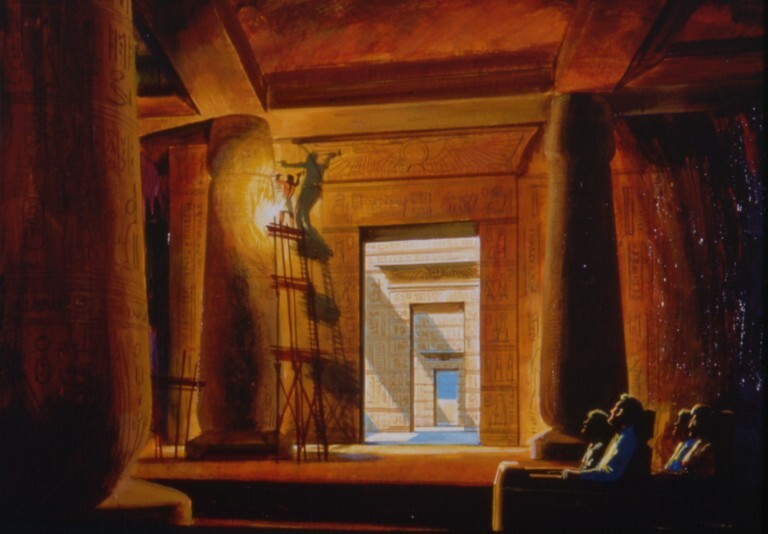 Below are three examples – the concept art for the ride, the actual scene (looks better without a flash), and an actual hypostyle hall from the Kom Ombo Temple in Egypt. The hieroglphyics depicted in the temple scene are reportedly accurate. The word hieroglyph literally means “sacred carvings” and the Egyptians first used them exclusively for inscriptions carved or painted on temple walls (2). Eventually the hieroglyphics were used in documents but in order for that to happen – they needed something portable and lightweight to write on. 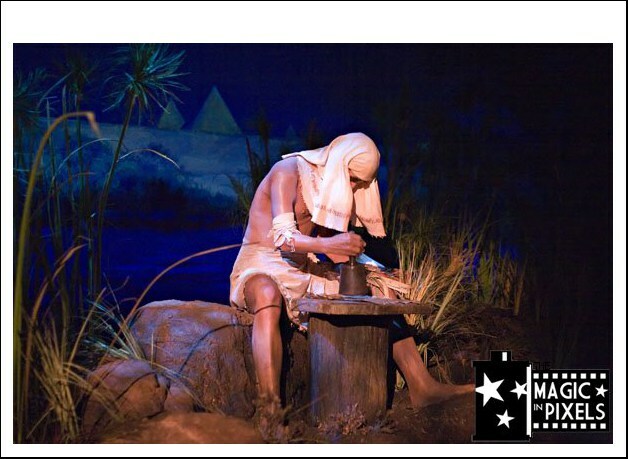 The scene on the left depicts a man sitting among the reeds along the Nile, pyramids in the background, pounding papyrus. The gentleman got a makeover in the 2008 Siemens refresh with more realistic movements but the message being portrayed is the same. 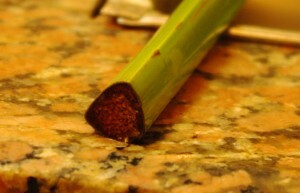 The Cyperus Papyrus plants are used to make papyrus. The root from these plants is triangular in shape which makes it easy to cut into strips. The basics of creating papyrus are to place the strips side by side on a hard surface with their edges slightly overlapping, and then another layer of strips is laid on top at a right angle. The two layers are hammered together, mashing the layers into a single sheet. The sheet is then dried under pressure. After drying, the sheet is polished with some rounded object, possibly a stone or seashell or round hardwood. A single roll of papyrus is about 20 sheets glued together. 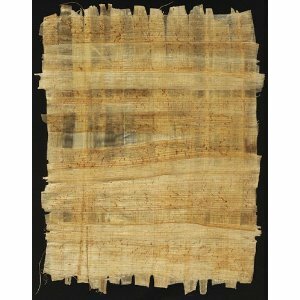 Papyrus were reused in many ways such as pasting strips of papyrus over cracks for patching and repair. New papayrus was available for administrative and ritual use while the private user obtained second hand papyrus (3). 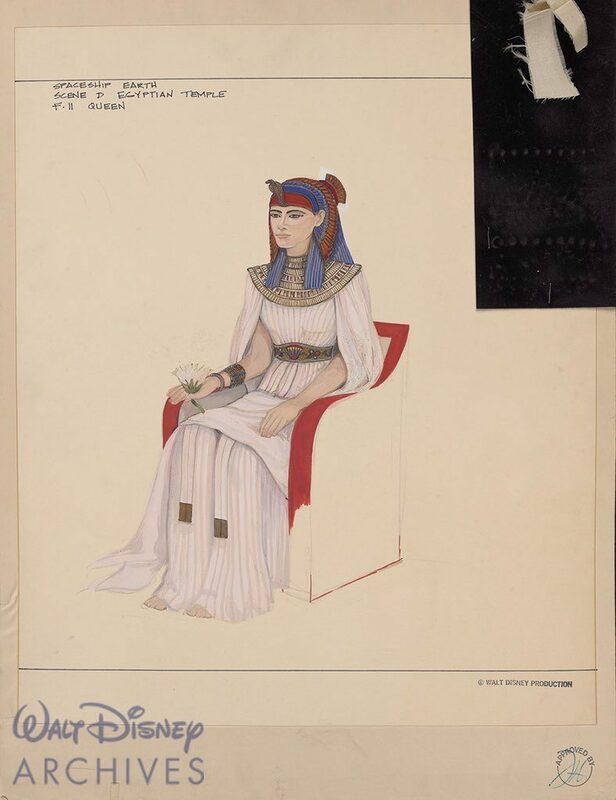 The Jeremy Irons script indicated that papyrus was the first paper but this was since updated with the Judy Dench version calling it a sort of paper. This is more accurate as the credit for inventing paper goes to the Chinese. As Dame Dench states Papyrus in turn creates better record keeping of plans, designs and unfortunately taxes. It is true that the need for documentation was administrative in need such as to track laws, farmers needed to track the land they owed and how much food produced, or merchants needed records to show goods sold and debts owed to them (4). Ultimately, the Cavemen’s writing and Egyptian temple hieroglyphics were stationary. Papyrus made it transportable. A pen and papyrus were seen as symbol of authority. The scrolls in the following scene, including the hieroglyphics are said to be duplicates of real documents written by a pharaoh (5) . The writing used is hieratic script, an ancient form of cursive – faster to write than individual hieroglyphics. The scene after our papyrus pounder is a pharaoh and his court, the pharaoh dictates a letter to his scribe, who is recording the words on papyrus scrolls. The hieroglyphics are said to be accurate. A – Duck and sun, also known as Son of Re’ (6) is the normal title for the birth name of the king, written outside the cartouche (royal name ring) as in the example to the left. This symbolizes a direct connection between the earthly king and Re, the ruling force in nature (7). B – The cartouche is the oval ring or a protective rope that encloses but also protects the personal name of a king. So we know that this symbolization is something that would be seen in Ancient Egypt but what I couldn’t figure out is what the name in the Cartouche is. The closest I was able to get was to Seti I. If this is indeed King Seti I, that would make his spouse Queen Tuya! The Scribe seen transcribing the decree is no slouch. Scribes were the only people in ancient Egypt who could read and write the sacred hieroglyphs that would appear on temples and in tombs and they were also the keepers of government records and wrote letters for the pharaoh. 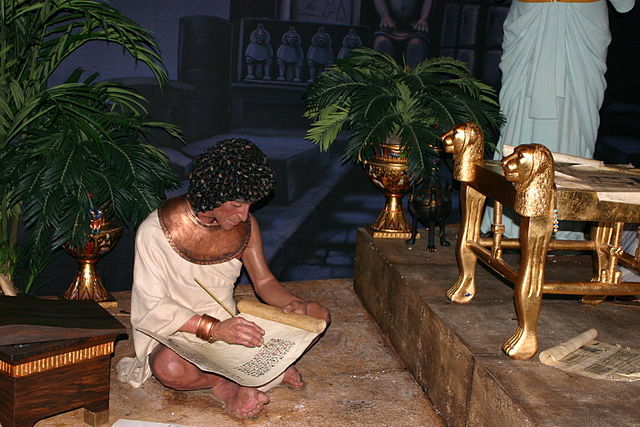 The scribe is writing in Hieratic – a cursive writing system used for Ancient Egyptian writing. The scribe is essentially the most important person in this room – they can read, write, and know where the mummies are entombed. Another change overtime was the King’s headdress. In the original scene the King is wearing what appears to be a Nemes headdress which would be a cloth covering a crown. It was later updated to the Double Crown or Pschent we see today – a combination of the Red Crown of Lower Egypt and the White Crown of Upper Egypt. It symbolised the joining of the two lands, and the pharaoh’s control over the two lands (8). In both versions the King has his staff (long pole), one of the most ancient symbols of authority. A cool detail added later was a crook (heka) – a sceptre in the shape of a shepherd’s crook normally made of gold and reinforced with blue copper bands. The crook symbolized that the pharaoh is the shepherd or the carer of the people (9). Because animatronics are complex, time intensive to create, and expensive – its common to duplicate the models that are made and dress them differently. In this scene – the vizier is said to also be President Taft in the Hall of Presidents (10). 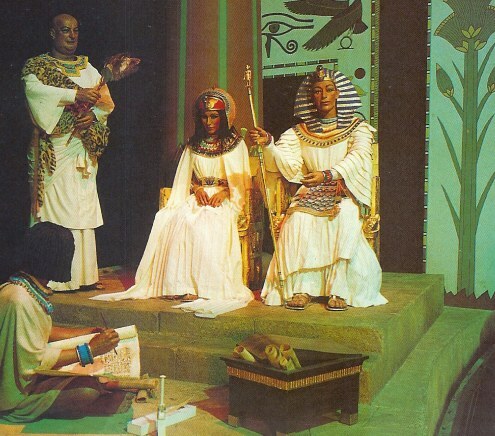 Now let’s move ahead to ancient Egypt, because something is about to happen here that will change the future forever. This unknown Egyptian pounding reeds flat is inventing papyrus, a sort of paper. Papyrus in turn creates better record keeping of plans, designs and unfortunately taxes. But it also brings with it the dawn of great civilizations. Ages later, the Egyptians invented the first written communication – a complex language of hieroglyphic pictures and symbols. With the creation of papyrus scrolls, came the world’s first piece of paper. 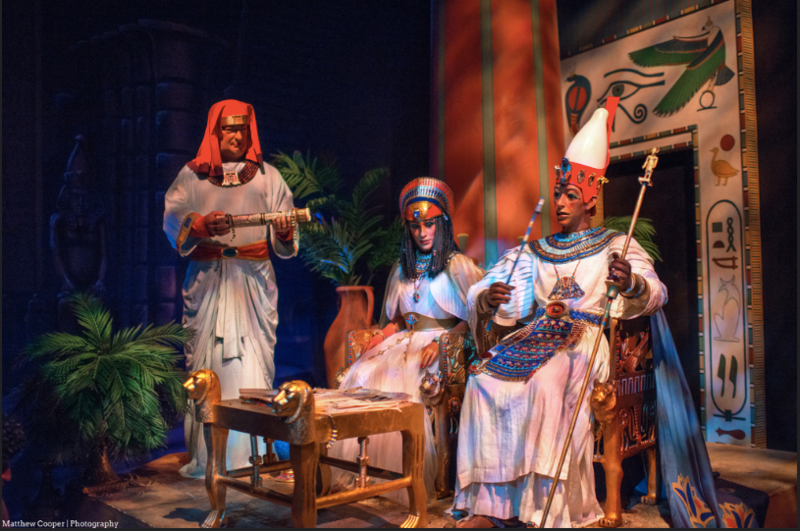 Now, without ever leaving their palaces, pharaohs could deliver proclamations and decrees to subjects across the land. Ages later, stories and knowledge are transcribed in complex pictures and symbols. Hieroglyphics mark the rise of written language and, soon with papyrus scrolls, the written word begins to travel out across the land. Ages pass and more walls rise in the valley of the Nile. Man-made walls of hieroglyphics. 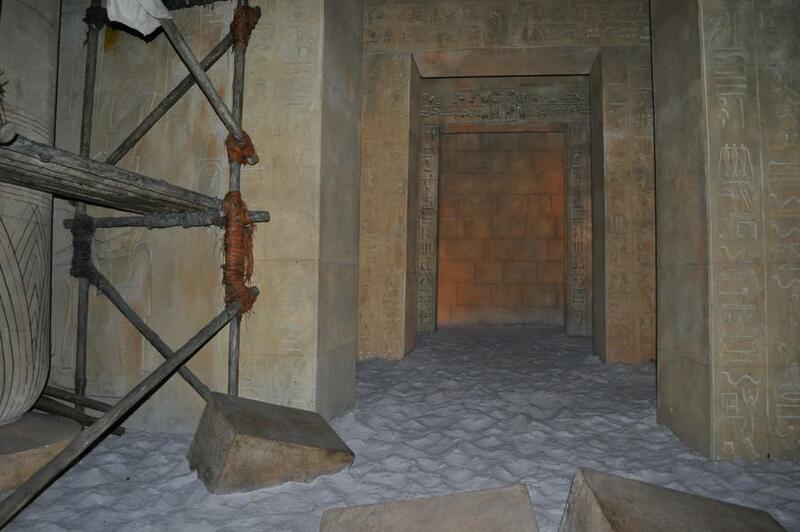 Then with new symbols, we unlock our thoughts from chiseled walls and send them forth on papyrus scrolls. We planted crops – took root! Worshipped gods who brought the wind and rain and sun. We built new walls – and chilled marks on stone to live through endless time. Recorded now – old tales once told by word of mouth alone. Eyre, C. (2013). 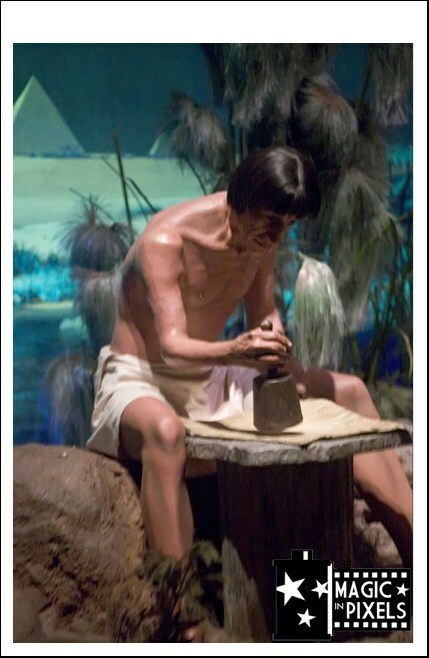 The Use of Documents in Pharaonic Egypt. Oxford, UK: Oxford University Press. Woods, M. (2011). Ancient communication technology : from hieroglyphics to scrolls. Minneapolis, MN: Lerner Publishing Group.